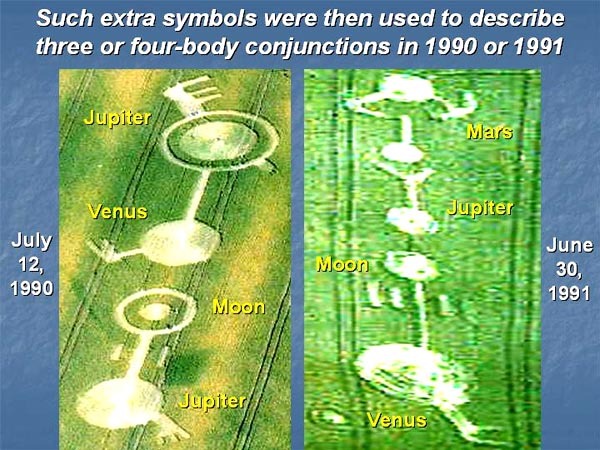 Many people living on Earth became startled or even terrified in the summer of 1990, when dozens of so-called "alien hieroglyphs" suddenly began to fill the fields of southern England near Wiltshire. Were extra-terrestrial aliens trying to talk to us? If so, why would they choose such a bizarre means of communication? "Denial is a defence mechanism in which a person is faced with a fact that is too painful to accept, and so rejects it instead, insisting that it is not true, despite what may be overwhelming evidence." www.earthfiles.com/news.php?ID=1288&category=Environment), but many people still remain in denial out of fear. The purpose of this essay is to remove such fear, by explaining what the earliest and "most fearful" crop pictures were all about! There is essentially zero chance that they could have be made by terrifying, extra-terrestrial aliens. Instead, they seem to have been made by other humans like ourselves who lived on Earth long ago---the builders of great megalithic sites all across the world including Stonehenge, Avebury, and perhaps various pyramids in Egypt or central America. Those ancient people were great scholars and astronomers, far beyond what most current academic historians believe. And somehow they came into the possession of a very sophisticated technological device known as an "engineered wormhole", that can send messages forward in time. Indeed, they have been showing schematic pictures in crops of that engineered wormhole almost continuously since the phenomenon began. So now those ancient scholars are apparently talking to us across thousands of years of time, using a space time wormhole or "portal". Researchers such as Toftenes have clear photographs of their wormhole opening in Earth's sky above a crop-circle field, then closing again. Some of their remotely-controlled devices have been well-documented on film. Those are the facts, not simple-minded fables for young children. But what might their messages be saying? Can we somehow read and understand them as for ordinary English? "As in the sky above, so on Earth below." That makes sense, because we do not know their written or spoken language, and they may not be able to understand ours very well. So they have chosen to send us other messages of a more universal nature, just like those which Carl Sagan sent out on Voyager, or beamed into space from Arecibo. Those same people also built spectacular monuments around the world that were similarly aligned with astronomical cycles: whether at Knowth in Ireland, the Temple of Luxor in Egypt, or a Pyramid of the Sun in central America. 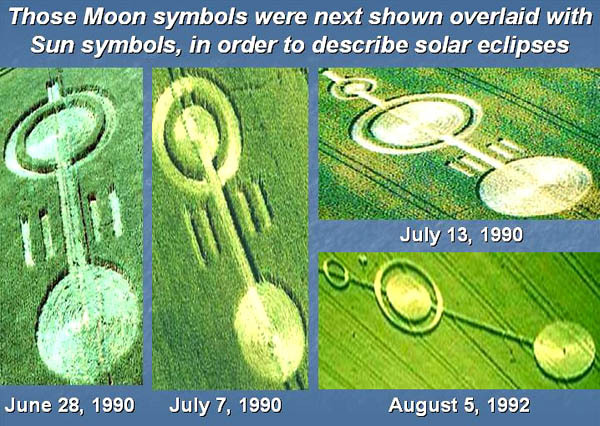 In previous essays, I explained how some of their crop messages show megalithic sundials or calendars, while others show lunar phase diagrams, and still others show the phases of Venus, or even an ancient Sun-Venus calendar that they use to keep time in our modern era. A few pictures show modern sky appearances by the planets Mercury, Mars, Jupiter or Saturn. Yet for the past 20 years, all of those terrifying "alien hieroglyphs" from Wiltshire 1990 to 1993 have remained a mystery: what could they possibly mean? Are aliens talking to us in some strange extra-terrestrial language? What fear will do! When we do not clearly understand something, our most basic human tendency seems to be fear and/or rejection. 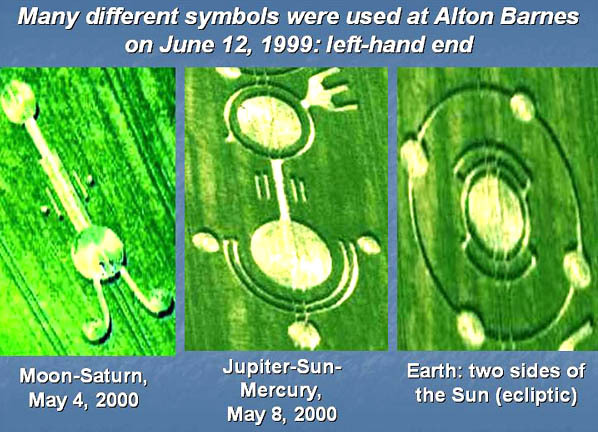 Here I will show how 30 representative crop hieroglyphs from Wiltshire 1990 to1993, including Alton Barnes in 1999, are also astronomical in meaning, and again show various events in Earth's sky contemporary with their appearances. Crop pictures might be considered as one of the greatest language-translation problems of the 21st century, if most modern scholars did not choose to reject this amazing phenomenon out of hand, before learning anything about it. 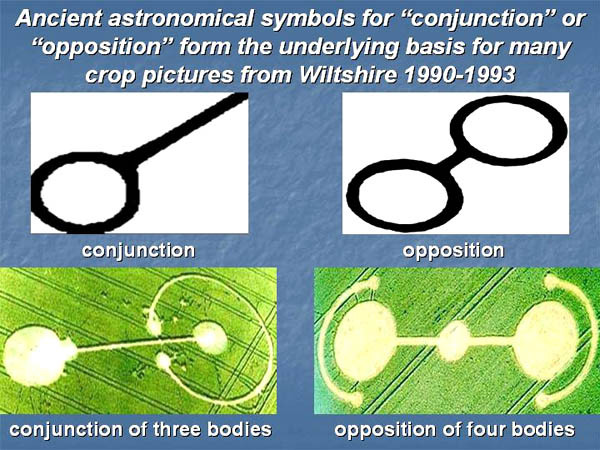 Ancient astronomical symbols for conjunction or opposition. Any simple conjunction involves a close approach in the sky of two heavenly bodies, say Venus and Jupiter. 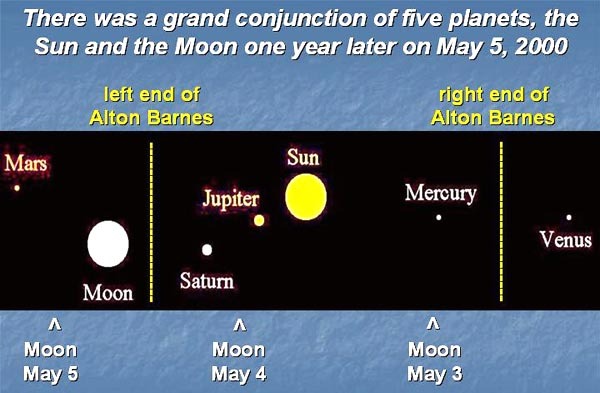 But sometimes we see a conjunction of three or four planets at once. 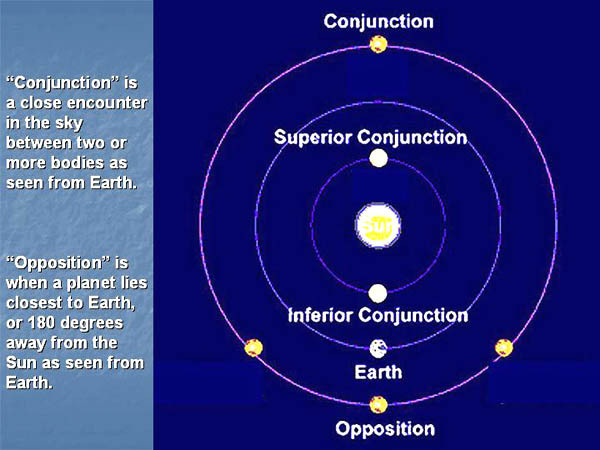 Similarly, any simple opposition involves a close approach through space of two planets, say Earth and Mars. But sometimes we see an opposition of three or four planets at once. Their symbol for "Sun" is just a big inscribed ring (as in modern astrology), while their symbol for "Moon" is a dumbbell that has been attached on one end to a small white ball (symbolizing a full Moon). Two thin lines have been drawn next to that Moon symbol on either side, in order to emphasize "rapid motion through our sky". Lastly, their symbol for "Earth" is a Celtic-Cross shape that resembles our planet with a single moon in orbit about it. 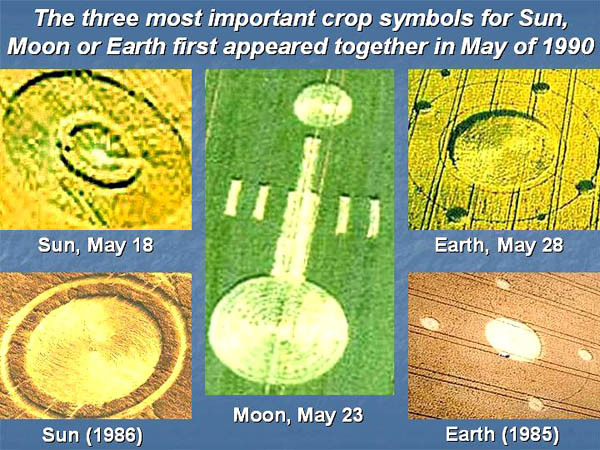 All three of those symbols appeared in close succession on May 18, May 23 or May 28, 1990. And that is exactly what the crop artists showed us next. They used a series of simple Moon-Sun crop pictures as shown above (and summarized below) to tell us when solar eclipses would be seen in Earth's sky during the summers of 1990, 1991 and 1992. 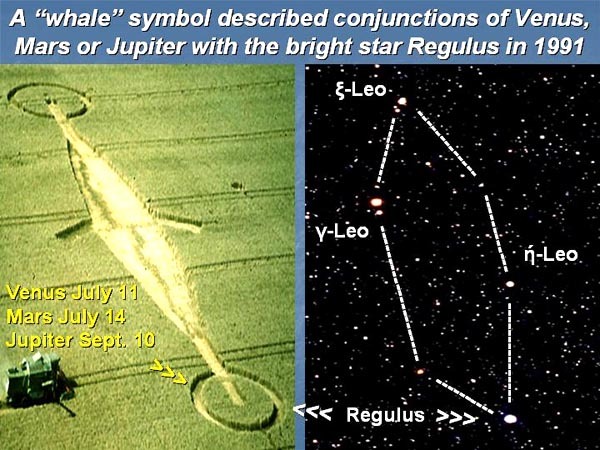 Likewise by the summer of 1991, another complex message had appeared, telling us about a double conjunction between Mars and Jupiter, plus Venus and the Moon, on June 15, 1991 (see above). 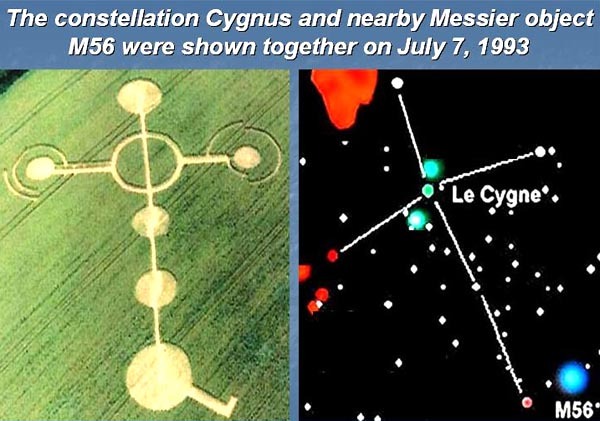 With those two clear examples in hand, I found it quite easy to deduce the detailed astronomical meanings of 20 more crop pictures of a similar kind, that also describe contemporary events in Earth's sky from 1990 to 1993. Those correlations are listed in Table 2 below, and may be confirmed with the help of an astronomical almanac from Jodrell Bank (www.jb.man.ac.uk/almanac). Most of those old crop pictures may be accessed through the archives of this website, after paying a small membership fee. typically two small lines are drawn on either side of the connecting line. 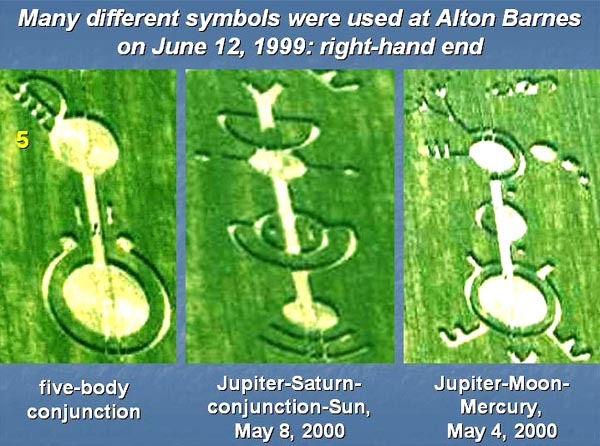 If they wanted to inform us that dumbbell-type hieroglyphs mean conjunction or opposition, what could have been a better way than to show us a spectacular, 1 km long crop picture to mark the grand conjunction of May 5, 2000? To me, their intended meaning was absolutely lucid and clear. 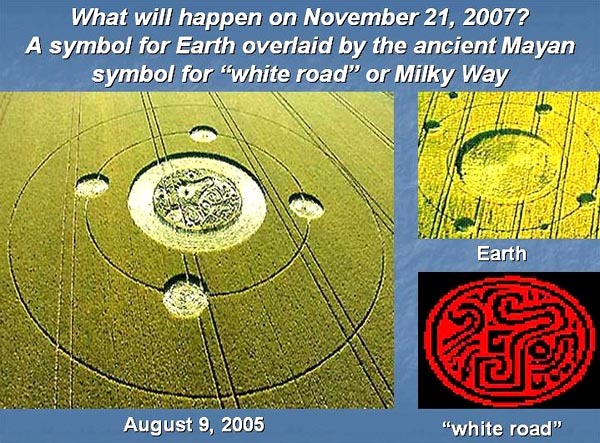 An overlay of two symbols for Earth and Milky Way in 2005: what could it mean? What could that possibly mean? One week later, another picture showing 18 triangles (to symbolize 18 months in a Mayan Long Count year) appeared nearby, and pointed to the earlier one. When studied together, those two pictures seem to say: "our ancient Long Count calendar will end when Earth's view of the Milky Way is eclipsed by your Sun, on the winter solstice of 2012". 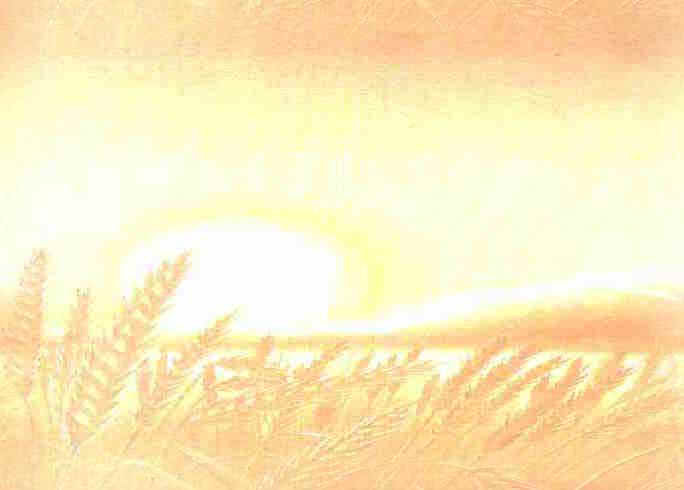 Now on the same day that Marden appeared, another famous crop picture appeared at Wayland's Smithy. It came in the form of a Mayan Sunstone, and showed two coded dates from their ancient Sun-Venus calendar that counts time in cycles of 52 years. Our current cycle began with a Sun-Venus conjunction on April 10, 1961, and will end with another Sun-Venus conjunction on March 28, 2013. Their first date "13-10-7" translated from base-16 into August 9, 2005, which was the day when that crop picture (and also Marden) had appeared. Their second date "14-5-11" translated into November 21, 2007 plus or minus two days. Evidently some major astronomical event will happen on November 21, 2007 (just one month from now). but I cannot find anything significant using an astronomical almanac (www.jb.man.ac.uk/almanac). Well, there are still some important problems left to be solved!